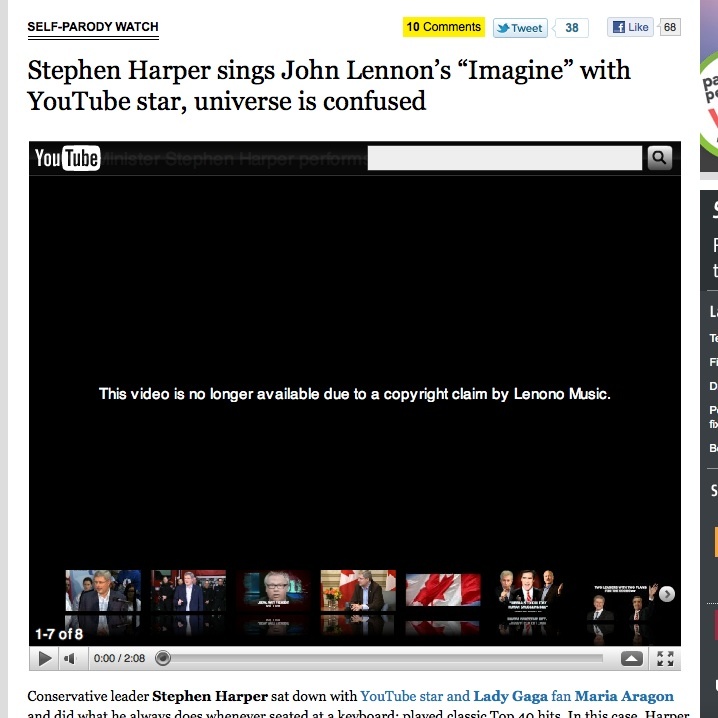 Props to Toronto blog Mondoville for noticing that the clip of Conservative Leader Stephen Harper singing John Lennon’s Imagine along with 11-year-old Maria Aragon had been pulled down from YouTube. In its place is a note that explains the video is no longer available because of a copyright claim by Lenono Music — the rights holder on Lennon’s and his widow Yoko Ono’s work. As I noted in an earlier blog post, there was concern about the Tories repeated use of the song, although it did not appear to covered by a SOCAN license. However, posting copyrighted works on YouTube is another matter, as we now see. Numerous other versions of the same clip are available elsewhere on YouTube, such is the whack-a-mole nature of online copyright infringement. Also, the clip of Harper sitting next to Aragon as she sings a Lady Gaga song is still featured prominently on the Conservative.ca website. Seems unlikely that GaGa’s people would take exception to this, given that the pop star has championed Aragon and made her a YouTube sensation. Less certain is how Lady feels about her music promoting the Harper campaign. The Conservatives have a history of ignoring copyright on music, despite their contentious reforms to copyright law. Former Industry Minister Jim Prentice was accused of lifting the theme song from The Apprentice to use in a press conference attacking Liberal taxation plans. A stern rebuke from Warner Music followed. Nice catch. Some feel themselves above the little people, like the late Lennon! So what’s the definition of cognitive dissonance? Stephen Harper playing John Lennon’s Imagine. We must be in pretty good hands if this is what we are complaining about. Cognitive dissonance? Can you say projection? Imagine’s lyrics are an example of progressive foolishness at best, but what would you expect from a guy who was so Fu*ked up on acid he married Yoko? Imagine there’s no Harper! It’s easy if you try. While I’m sad to see any content on YouTube be censored by copyright, it is nice to see Harper get a taste of his C-32 medicine. Well, using the link below they have to delete approx 7,100 more video’s to to meet the Copyright Claim by Lenono Music. Wonder it that will be done? Doubt it. Ah the Liberal war room. So small minded.